Goldman, Leon. 2017. 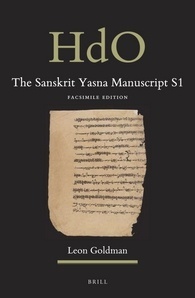 The Sanskrit Yasna Manuscript S1. Facsimile Edition (Corpus Avesticum / Handbook of Oriental Studies. Section 2 South Asia, 32/1). Leiden: Brill. The manuscript S1 is one of the chief witnesses to the Sanskrit Yasna, containing the Avestan text of the Zoroastrian Yasna liturgy to chapter 46.19, together with a Sanskrit translation and commentary. This book contains the complete, full-colour set of facsimile images of S1. An introduction by Leon Goldman provides an overview of the Zoroastrian Sanskrit tradition together with a discussion of the S1 manuscript covering its physical appearance, its age and history, and for the first time, a detailed palaeographic analysis of the Avestan and Sanskrit text.